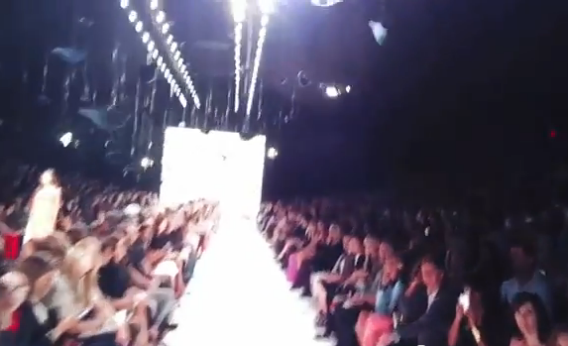 Google glasses video: DVF runway models shoot bounciest footage since Blair Witch Project. Video shot with Google glasses at Diane von Furstenberg’s New York Fashion Week show will make you wonder how models make it down the catwalk without getting seasick. Ever wondered what life looks like through the eyes of a model strutting down the runway in front of thousands of fashion luminaries at New York Fashion Week? Judging from a promotional video put together by designer Diane von Furstenberg using Google’s “Project Glass” augmented-reality glasses, we can now see for ourselves. It looks… bouncy. I assume it’s an accident that the soundtrack is a song whose chorus goes, “feels like an elephant shaking his big gray trunk for the hell of it,” but it’s an apt description for the footage that results when you shoot video from your glasses whilst wearing high heels. No wonder Google’s initial unveiling of the technology only showed us only still photos shot by a man running along a trail. Sure, it’s cool that Google glasses will let people turn their daily lives into a movie with the flick of a switch, I guess. But if this video is any indication, the company has some kinks to work out before these specs hit the mass market. Until then, will someone please get these women a Lumia 920? Preferably the fake version.